This exhibit features new paintings in the third solo exhibition of one of America's leading contemporary realist still life painters. Mixing a classical approach to painting with contemporary objects and innovative compositions, Fraser experiments with cause and effect and sleight of hand putting his own unique stamp on the subject matter. 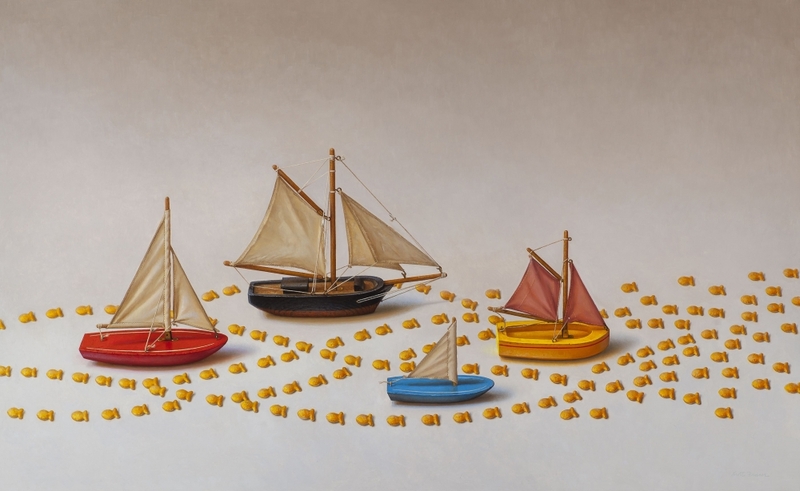 Scott Fraser’s hyper-real oil paintings will astonish and delight fans of the traditional medium; it’s given new life in the artist’s subversively humorous compositions, staged in the still-life tradition. A largemouth bass eagerly devours a steady stream of Goldfish crackers, a cricket improbably balances on a pencil over a box of spent matches–and so it goes, art imitating life imitating art.